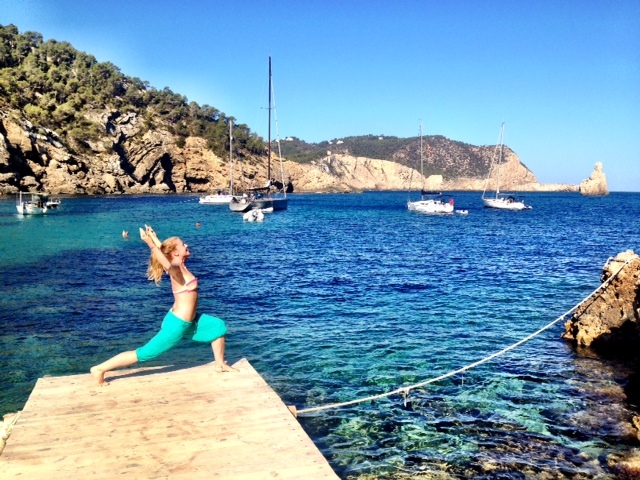 I am just back from a wonderful yoga filled (and a bit of dancing) holiday in Ibiza. It really is a special place, it has a beautiful light, fun energy about it. Don’t let all the programmes of drunken clubbers put you off if you haven’t been yet! 3 of us were yoga teachers in our villa so we enjoyed sharing our different practices whilst together. Yoga is so diverse there are just so many aspects of it to explore, it can feel never ending. I love that. 1. Start off by doing some spinal breathing for 5 or 10 minutes. (it’s useful to use a timer on your phone for this) To do this you start to inhale from the base of your spine, your root chakra and work your way up all the way to the point at the base of your skull, then hold the breath and bring your attention to your third eye (in-between your eye brows), back to the base of your skull and exhale all the way back down your spine. Repeat. 2. Next meditate repeating “I AM” continuously. This is for twice the time you did the breathing for, so if you did 5 minutes then you do this for 10. You will drop “I AM” every now and then when your thoughts interrupt, this is fine, what is important is that you notice you have done it and then start again. These are all qualities we have within us. It’s amazing the different feelings that emerge for each one. You could just do one round of this or more if you have time. This entry was posted in Yoga on July 23, 2014 by louise.